Knife---can't live without it. However, I was watching Bizzare foods last night and Andrew Zimmern did pretty well with a machete. It was useful in chopping wood and hacking his way through the vegetition. Then I thought, "what about a hatchet?" same sort of thing, but even better for making poles for the shelter, and customizing the firewood. Not sure which one/combo to use here. Compass---normally I'd say yes, but we're in a area I've been to many times and am familiar with. So I'm tempted to say no on it in this instance. What input/suggestions can you offer, or better yet what five things would you take if you were in our shoes? You know eric, I'm a fan of these 'what would you bring, or what would you do' things because they allow me to see what other people consider essential goods. I'm a minimalist so really, I don't need much, but on the other hand I have way to many interests and they always find a home in my backpack. For me it'd be; copper cup, magnesium knife, flint/steel, mosquito net, earl grey tea. Everything else I could either find or make including cordage, but a good cup of tea is a must. Hah Im drinkin earl gray tea right now ice tea with sugar. My favorite. Knife probably my Cold Steel SRK. My own flint and mag bar kit. Big sheet of Visqueen a brand of plastic sheeting. Cell phone if theres any possibility of a signal or if not Spot. WOW - Great minds think alike! I was just typing and then read yours - It's the same thing in different order. 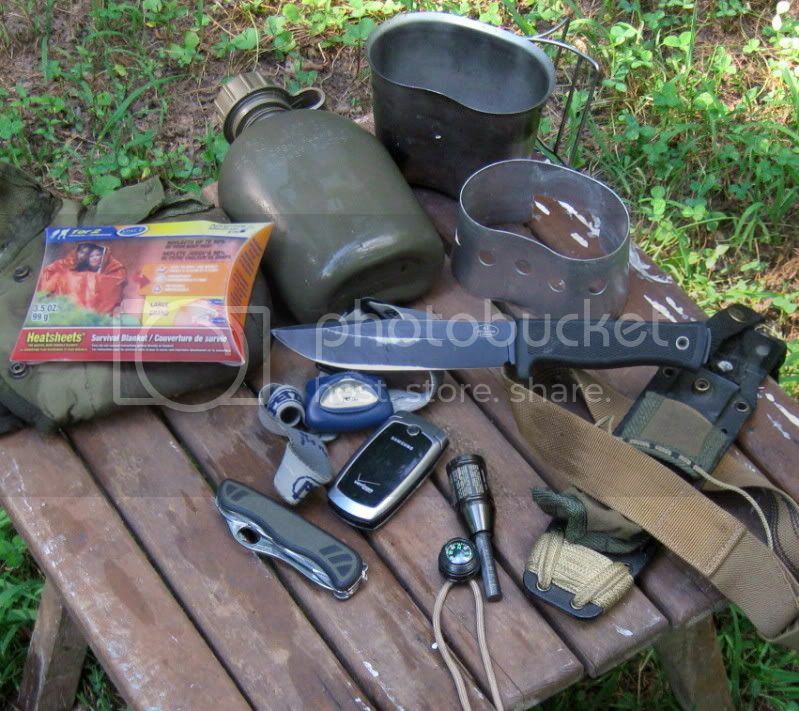 Don't know what kind of metal pot you have but mine is a canteen kit. Oooo - good choice - especially on a outing style trip. In some places here it is treacherous enough to move at night with a light...I'd hate to try it without one. Under the canopy there is very little (practically none) light at night. In some places here it is treacherous enough to move at night with a light...I'd hate to try it without one. Under the canopy there is very little (preactically none) light at night. Good point. It's a fact Mist that anyone north of 30 should have mosquito netting on their list, but especially in the boreal forests. They aren't especially aggressive, but they more than make up for it with numbers. They are getting worse here by the year. I need to make a run out to the surplus store and see what they have on hand. Here, since I don't have any on hand, I would just set camp out near the edge of a bluff where there is a constant breeze and they aren't bad at all but in some places they get really bad. I know they sure were bad in the back side of Tampa Bay when I was younger...especially at sundown, and seemed even worse if it was a low tide. I love my guyot very much don't get me wrong, and if I had an insulated case for it like that of the G.I. canteen that held both my guyot and the cup I'd definitely pick it over the GI canteen. The reason I chose the canteen kit is that it is essentially one item in it's cover but also has the cup and stove that it nests in so it gives me the ability to store water and cook simultaneously. With the guyot alone I have to choose one or the other. I forgot about my Swedish alcohol stove. I think Ill change the stainless pot. A torch would be a close second to the saw. Knowing you have both had me wondering for a few. I was looking at those Swedish kits the other day at the surplus store. I'm going to have to pick one up some day. The skeeters are a mess but a nice shelter and a smoke screen makes them bearable. That was my thinking. I don't really have a problem with them once I get my fire going and stand in the smoke for awhile. And just to throw this in there....take a first aid kit and just don't call it one of the five items. Swede brought up a good point. Being simply told "only five items"...and knowing what I already know...my five items might very well look like this (I chose the heat sheet because my poncho is gone in Lisa's car) if there was cellular signal in the area. 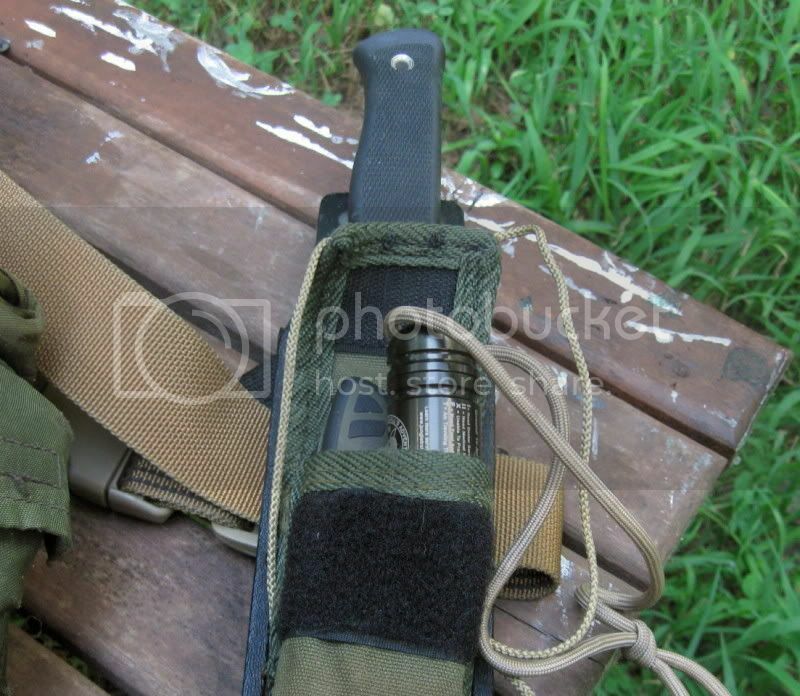 But because some of these things have things that "nest" within them...such as the pouch on my knife sheath. And I end up with Shelter capability in more than one form with things like the e-blanket, plus 28 feet of braided cord (to go with the 4 meters of para cord that lives on my wrist) to use to tie up natural materials if needed, and Both a water storage vessel and a cooking pot. 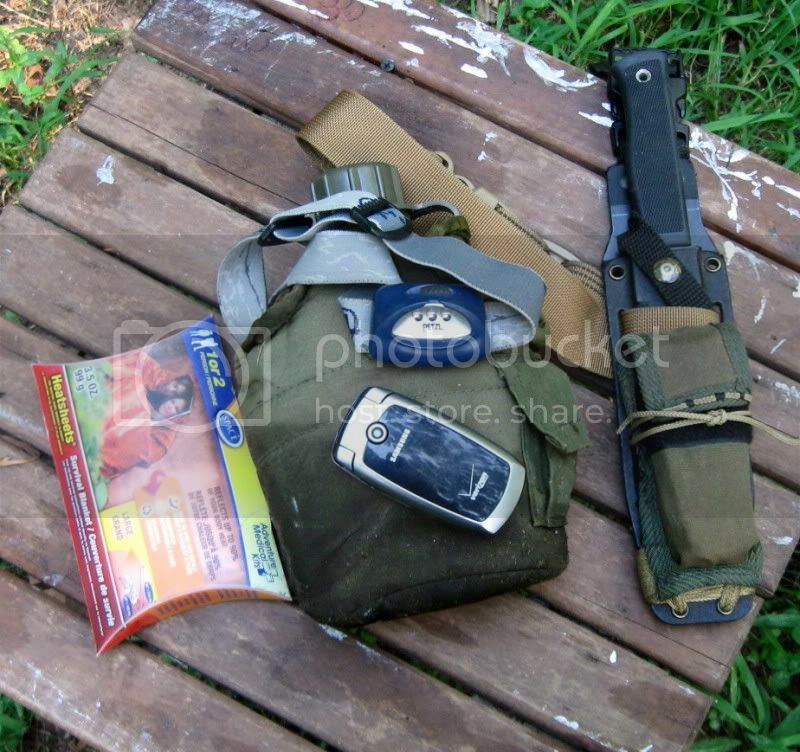 I'd have multiple cutting edges, a compass, a ferro rod (which also holds other things), a light, and communications. Oh...and not shown is the new signal mirror in the sheath pouch also. Mike (pres. TOPS knives) gave me a few while I was at blade. They are highly polished plastic but have a protective film cover on them to keep them from getting scratched until you need them, pretty awesome I think. How are we defining one item? If I put all my gear in an 80 litre pack is that considered one item? I'm with you on that one. While I understand the attraction to people wanting to 'get out there' with as little gear as possible to try and test their survival abilities, I myself would never do it. Why not just take your normal hiking gear and then try and use only your five designated items? At least then you have backup supplies to prevent it from turning into a real survival situation.